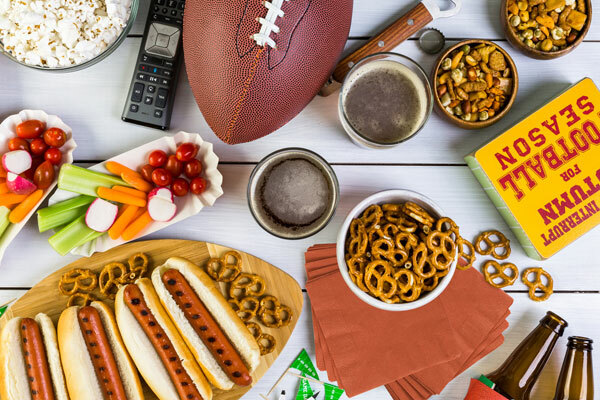 Are you looking to host the ultimate football party this year? We’ve got some helpful entertaining advice that will help make your party prep, set-up, and break down stress-free and easy. Here are our favorite party hosting tips and must-haves. Trust us, the secret to fast and easy party set up is early prep and organization. On game day, the last thing you want to worry about is whether or not you’ve made enough dip for a party of twenty hungry sports fans. To make the meal prep easier, start a day early with snacks, and baked goods. Then store them in food-safe containers with clear sides (or flat enough sides to label them appropriately). From our own experiences, we’ve found that containers with clear surfaces allow you to see your food quickly, which makes the party set-up more efficient. If you’re a regular party planner (or restauranteur) and know the value of food prep, then take a look at our full collection of plastic food containers here! When it comes to the big game, go for high impact, colorful decorations with tissue paper. For our own parties, we like to use pre-folded tissue paper items and accent with colorful tabletop items. Pre-folded tissue paper decor is the easiest thing in the world. Simply unfold and hang! To coordinate, we use colorful tabletop items like table covers, cutlery, and napkins. FYI: If you’re looking for an easy Super Bowl tablescape idea, check out our DIY Super Bowl Centerpiece tutorial. For more decor inspiration, check out these party backdrops and centerpiece DIYs! An element of the party that everyone forgets about is the breakdown, the winding down moment after the celebration which signals an end to the festivities. It’s when the game has ended, energy levels have lowered, and the urge to nap is very real. Send your party guests off with something to remember with a cute DIY party favor and a take-out box of their favorite snacks. We’ve found that letting your guests take food home is an easy way to be a gracious host and ease the cleanup process by lessening the amount of food to put away. At our parties, we like to keep boxes and bags for leftovers accessible. As the party winds down, place them near your food. This allows your guests to easily pick and choose the snacks they want to take with them. How are you celebrating the big game? Show us using the social tag #mypapermart. If you loved these tips and want to see more, stay tuned. We’re looking forward to making more product features, tips for small businesses, and DIY craft videos!